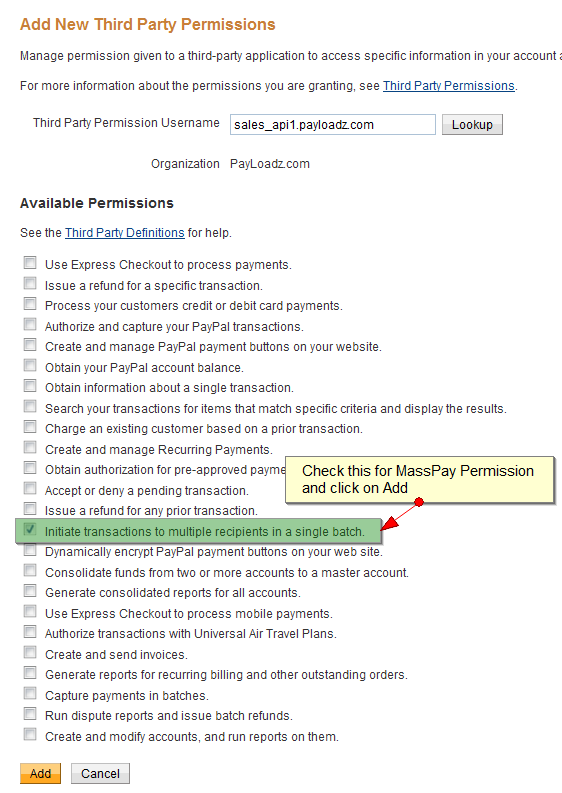 Important: PayPal Mass Payment is not activated automatically. You must contact PayPal to activate it. Your account manager can arrange for it to be activated when you are ready to go live. After having Mass Pay activated please proceed. 1. Log into your PayPal account, click on the "Profile" navigation link, select "More Options" from the drop-down menu. 2. Click on "Selling Tools". 4. Select Option 1 - Grant API Permissions. 5. Add the following url: sales_api1.payloadz.com a,d then click "Lookup". 6. Check the button named Initiate transactions to multiple recipients in a single batch in the list of Available Permissions. Then, click to Add button to Confirm API Permission. What is PayPal Mass Payments?